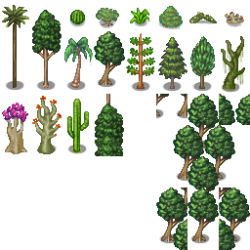 A few cute trees of different shapes and sizes. Great for world maps. Free for non-commercial and commercial uses. 2017 - Rayane Félix. This work is licensed under Creative Commons Attribution-ShareAlike 3.0 Unported. Beautiful job. It has a very attractive style.